I'm currently re-reading all of Diana Gabaldon's 'Outlander' series. This isn't the first time and it certainly won't be the last. With the Starz adaptation of 'Outlander' on the horizon, I should imagine that I'm not alone in these endeavors. At the time of writing, the first scenes are being shot north of the border in Scotland. It's taking all of my willpower not to jump in the car to go and see! Instead I'm generally to be found curled up on the settee, with a mug in my hand steaming as much as my imagination. What better then than a mug inspired by the 'Outlander' series itself? Most of the Outlander coffee mugs on the market are fan made. The first on offer is practically unique in that it has Diana Gabaldon's blessing attached to it. There's a reason for that. All profits from the (Fraser) Tartan Logo HH mug go to charity. Leukaemia & Lymphoma Research is the beneficiary. It's a cause which actor Sam Heughan has personally supported many times, including running marathons to raise funds. Naturally the Heughligans have joined forces with gusto! If you're wondering who these people are, then this is probably not the mug for you. Sam Heughan is the actor playing Jamie Fraser. The Heughligans are Jamie Fraser fans turned Sam Heughan fans, as soon as his name was linked with our favorite Lallybroch laird. Kelly Mager of Outlandish Artistry designed the mug. The legend reads: 'Heughan's Heughligans. Est 2013'. That's a year before the television watching world discovered Jamie Fraser. That seriously marks you out as an original fan! Of course, you don't have to be subtle about these things. If a splash of Fraser tartan and name-dropping Sam Heughan would be lost on your audience, then declare your meaning from the rooftops! Nobody watching you sipping from either of these Outlander fan coffee mugs will doubt where your sympathies lie! Then again, it may not be more obvious, but downright mysterious that you're seeking here. Well, dinna fash yourself, we can cater to you as well. 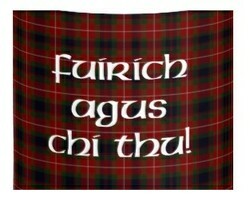 Until Echo in the Bone, casual readers would have searched in vain for any Gaelic speaking individual uttering the famous words: fuirich agus chi thu. When Claire actually does say it, die-hard Outlander fans everywhere cheered and giggled. This was the author nodding towards those she knew would be reading. Fans knew what was going on. Everyone else wouldn't even catch the reference. Fuirich agus chi thu translates as 'wait and see'. It's Diana Gabaldon's standard response to anyone asking her for clues to where the storyline is going! On the subject of hidden messages, there's the most famous one of all from the Outlander series. ... well, you know the rest. And if you don't, then you should. Read the books. If you're on this page browsing for gifts for an Outlander fan, then your clue is this: Da mi basia mille means 'give me a thousand kisses'. It's the perfect romantic present for someone you love. I giggled when I read the legend on this Outlander mug, but only because I had such sympathy with the heart-felt plea upon it! NO! NO! It's not too much to ask at all! I'd be first in line to do it! Honestly, I would! In fact, pick me. Please universe, pick me. I'm an historian for crying out loud! I'd really appreciate it! And in lieu of all that, I'll just settle for the coffee mug. 'Caution', this mug warns, 'Watch out for standing stones'. I love that it's on a toxicity symbol! In no way would we consider making a running leap through one, if we should feel a sudden pull. It's ok, Heughligans! I think I've got us covered. Now back to the checklist. Are we sure that we've personally inspected every stone circle in the vicinity of Inverness? How about the rest of the Great Glen? I'm going to stop writing this now, and go and look. Civic duty, ye ken? None That you Liked? More Outlander Coffee Mugs Here! I'd say so. But then, I'd say that anyone would like them. There's something in there for everyone anyway. However, you've never struck me as the historical novel kind of person. Ember/Jo - Is this book/show that someone like me would like? You have no idea. This is the second most exciting thing to happen this year. The first being a new Sandman.